After the doctor has studied your health history, analyzed your x-rays and correlated your examination findings, he’ll know exactly what is going on with your spine and nervous system. What will we do to help you achieve your health goals? We recommend that you bring a family member or trusted friend with you to ask pertinent questions and help make this important decision. Once you’ve accepted care, you will receive your first spinal corrections, which is tailored to you. Each person is unique in every way and this includes misalignments in the spine. 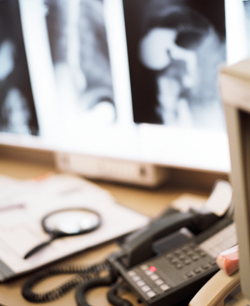 Your x-rays tell the doctor the exact amount and directions your body has misaligned and how to correct it. The doctor will verify the quality of the correction with a post adjustment Thermal Scan. Each adjustment experience and healing response is unique to the individual. People describe feeling various sensations such as: lighter, looser, clearer, more balanced, etc… One thing is common; the light touch of the adjustment will set your body in the direction for achieving optimum health. Following the initial correction and balancing of the spine, subsequent visits focus on training the body to maintain this correction and keeping the body free from nerve interference. During initial intensive care, visits are more frequent to gain momentum in the healing process. It takes time for ligaments and muscles to relearn new ways of moving and functioning. It takes time for the body to re-learn how to stay balanced and re-open healing channels previously blocked. We will monitor this process during your regular visits and with progress exams every 12 visits. We respect that your time is valuable and ask that you do the same for us. We do everything possible to run on time and minimize the impact on your busy life. About 95% of the time we are on time and since we have reserved a time for you we ask that you be on time so we may serve each practice member in a timely fashion. We utilize a state-of-the-art paperless system, so there is no searching for your file. You type your given password at the front computer when you enter the clinic, which will automatically check you in. When a room is ready for you, you will be called into a room where you will lie down . As you lie on your back, take the time to relax and prepare to be checked. The doctor will take an infra red thermal reading and check to see if there is nerve pressure. The results of these measurements will tell the doctor if you are holding your correction or not, as well as the progress your body is making with the correction on a functional level. How long will our visit be? Like a regular workout at the gym, each visit builds on the ones before. Miss a visit and we lose critical momentum necessary to make the needed changes at the right time. Typical office visits can last anywhere from 15 to 30 minutes depending on your individual requirements that day. Because we work with many families, we invite you to bring your loved ones with you.